Skunk2 Pro-Series high performance coilovers are based on over a decade of racing and suspension tuning experience. The advanced technology we have used in numerous road racing and drag racing championships is now being applied to our new line of Pro-Series coilover suspensions. Skunk2�s track and street tested valving offers the perfect balance for the daily drive or for spirited performance driving. Pro-Series coilovers feature shortened shock bodies and shortened shaft strokes so suspension travel can be maintained on lowered vehicles for improved performance and comfort. With Skunk2 coilovers, enthusiasts can quickly and precisely set ride heights and corner weights to improve the vehicle�s handling response, cornering ability, stability, and balance. Our full coilover suspension is offered in our nonadjustable dual-tube PRO-S design, or our PRO-C adjustable mono-tube design. Skunk2 coilovers include hard anodized CNC-machined forged 6061-T6 spring perches and Skunk2 CNC-wound racing springs made from SAE9254V spring steel. 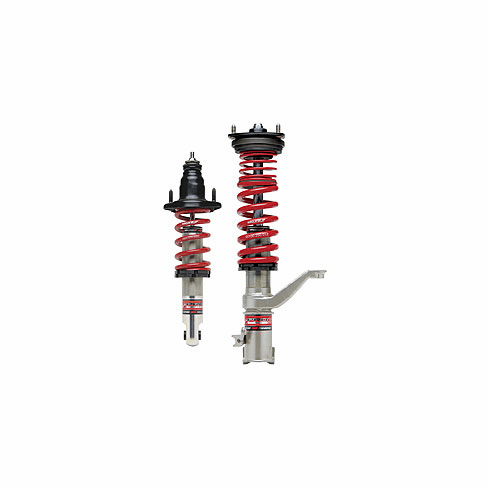 PRO-S dampers are the perfect basic high-performance full coilover suspension. PRO-S dampers are designed for drivers who are seeking an integrated coilover and shock set-up. PRO-S dampers feature pre-determined precision valving and carefully selected springs that are designed to dramatically improve handling performance by significantly increasing corner grip and reducing body roll, allowing the driver to feel greater control and stability at all speeds. Skunk2 springs are CNC-wound using the highest quality SAE9254V spring steel. Each spring is designed to optimize the balance between performance and comfort, and are custom matched to PRO-S dampers. PRO-S dampers provide an average drop from 1� to 3� for a sporty yet aggressive look. The PRO-S suspension offers dramatic improvements to handling while retaining an entry-level price.